Livestock manure can be a valuable source of nutrients, but it also can be a source of human pathogens if not managed correctly. Organic certification programs currently include strict requirements on the handling of raw manure. Even though these requirements are designed to minimize environmental risks, it is important that all farms using manure follow good agricultural practices to reduce any microbial risk that may exist. Proper and thorough composting of manure, incorporating it into soil prior to planting, and avoiding top-dressing of plants are important steps toward reducing the risk of microbial contamination. Store manure as far away as practical from areas where fresh produce is grown and handled. If manure is not composted, age the manure to be applied to produce fields for at least six months prior to application. Where possible, erect physical barriers or wind barriers to prevent runoff and wind drift of manure onto plants. Store manure slurry for at least 60 days in the summer and 90 days in the winter before applying to fields. Actively compost manure. High temperatures achieved by a well-managed, aerobic compost can kill most harmful pathogens. Remember to optimize temperature, turning, and time to produce high quality, stable compost. Cover crops and injection methods lend themselves well to both incorporate the nutrients well ahead of the time of planting fruits and vegetables but to also decrease runoff of manure applications. Photo by N. Rector, Michigan State University Extension. Apply manure in the fall or at the end of the season to all planned vegetable ground or fruit acreage, preferably when soils are warm, non saturated, and cover-cropped. If applying manure in the spring (or the start of a season), spread the manure two weeks before planting, preferably to grain or forage crops. DO NOT harvest vegetables or fruits until 120 days after manure application. Incorporate manure immediately after application. Although it is known that many harmful pathogens do not survive long in the soil, research is still needed on soil microbes and pathogen interactions. Some pathogens, such as Listeria monocytogenes, may survive and grow in the soil. If it is necessary to apply manure or slurry to vegetable or fruit ground, incorporate it at least two weeks prior to planting and observe the suggested 120-day pre harvest interval. If the 120-day waiting period is not feasible, such as for short season crops like lettuce or leafy greens, apply only properly composted manure. Avoid growing root and leafy crops in the year that manure is applied to a field. Apply manure to grain or forage crops. 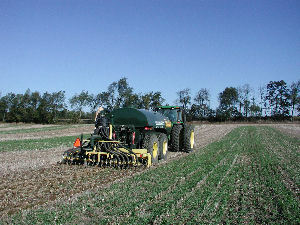 Apply manure to perennial crops in the planting year only. The long period between application and harvest will reduce the risks.